By now, many people know that to generate traffic to your website, you need to write a blog that ranks on the first page of Google. You do this by creating articles that have long-tail keywords and phrases. Using long-tail keywords is one of best and quickest ways to rank on the first page of Google. So, how do we use long-tail keywords? One method I suggest you avoid is using some service claiming to rank you on the first page “instantly”. There is no quick-fix or magic solution. If you see one of these, click the back button. There is no way they will do this for you without you getting penalized by Google in some way. It’s too bad that these scammers exist. Many people think that doing it the right way is too difficult and these services are the only way to go. Then, you end up suffering in the long term. I know many of you are skeptical that it’s even possible to rank on the first page without using some paid advertising or Adwords program. If you keep up with the SEO industry, you are fully aware that Google changes it’s algorithm on a regular basis, and content similar to yours is being pushed out at a rapid pace by your competitors. So, you wonder if it’s even worth the time and effort to create new content to rank for. The odds you will rank for the exact keywords such as “Logo Designer” is very unlikely. There is just too much competition. Those are what is referred to as head terms. They are often copyrighted, trademarked and owned by established businesses that can pay the big bucks for them. However, we are talking about using long-tail keywords, not head terms. You want to rank for terms that get views, clicks and convert into sales. Remember, someone is always going to rank on the first page of Google. For this to happen, these businesses had to do implement the right strategies to rank there in the first place. So, what did they implement to get there? I will now show you an easy and guaranteed way to rank on the first page of Google for long-tail keywords. This won’t be some scam, hack or magic solution. I will not lie. It will take some hard work and effort. If you think I am going to give you some workaround trick to by-pass Google’s algorithm, if that’s what you want, leave this page. I am going to give you a proven method, but it will take some work. This is a real, straight-forward method for ranking on the first page of Google, genuinely ranking for keywords, and grabbing that holy-grail of spots on the internet search results. Page #1 of Google. Here is the recipe for ranking on the first page of Google using long-tail keywords. You need to research your keyword. Does it even matter whether or not you research your keyword? The answer is ABSOLUTELY YES! It is extremely important. Actually, the only real way you will successfully rank high for any keyword is to do the research on the keyword or phrase. That’s exactly how you need to begin with the grind of ranking high in the SERPs. We need to find the right keyword. So, what exactly should you try to find when searching for the right keywords? So, the first thing you need to do when looking for a long-tail keyword to rank for is to make sure it’s of a good length. The suggested minimum is said to be about four or five words. Look into the length of searches that are the norm for long-tail keywords. Just don’t go the opposite extreme and try to create a 10 word long-tail keyword or one that is two words long. You’ll end up competing against too many other websites, and you won’t get ranked. Anytime you are searching for a keyword to rank for, you need to look for a keyword or phrase that does not have a high level of competition, but will still bring you a considerable amount of monthly searches. While long-tail keywords don’t have a huge amount of searches, you can still use them effectively. You are not trying to get a high volume. Rather, you are looking for the intent of the searcher. You much rather have fewer searches and a higher ranking, than to have a terrible ranking for a high search term. 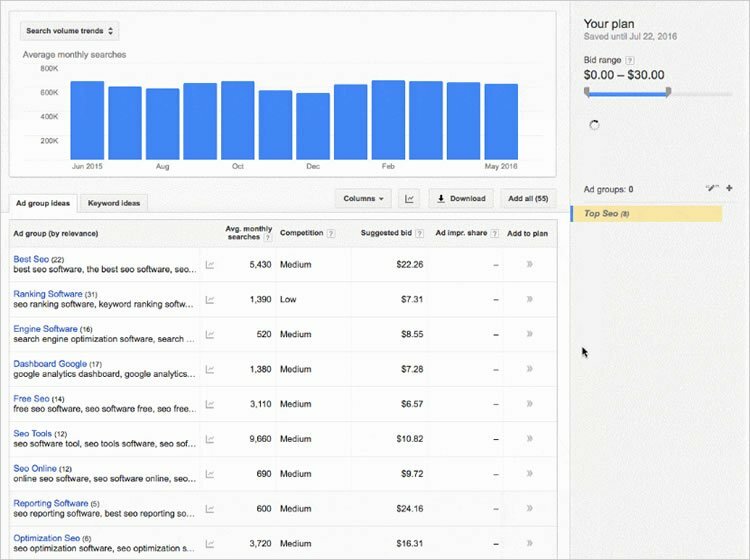 Don’t forget your Google Keyword Planner. You should be using this tool often to see the competition for these keywords. The best part about using long-tail keywords is that there is no limit as to the terms you can use. Believe it or not, about 75% of all traffic is as a result of long-tail keywords. What’s most important is to search for descriptive keywords. By this, I mean keywords you know can convert. What is more important than keywords themselves? It’s the intent of the user. An example of this is when a person searches for a keyword you are trying to rank. Is the intent behind the search based on shopping, purchasing or simple browsing the web? What’s good about long-tail keywords is that user intent is actually very obvious. Head terms such as “ipad” and “tablet” are not all that descriptive. You will not be able to get a real understanding what the searcher is looking for. However, when you use long-tail keywords, this is when you can narrow it down. Someone searching for “Apple iPad Mini 16 GB” is looking for something specific. Once you can understand the long-tail user intent, which is not hard to do, you can now easily create content for the exact user intent. The result is that you will easily rise to the first page of search results. One of the best ways to ranking in Google is to make sure your headline is populated with keywords. The words you put in a headline matter to the customer. So, you can believe they matter is SEO too. The behaviour pattern of most people is that they pay attention to the first couple of words of the search phrases to determine if you have the content they are searching the web to find. So, experiment with different variations of the headlines you plan to use. This way you can find the right keywords that will grab the attention of the user as fast as possible. As you can see, these headlines clearly grab the attention of the reader. It lets the person know what the content will be about from the very beginning. Anytime you use a long-tail keyword in the title or headline, you will let the SERPs know that your content is valuable to a searcher looking for that subject. Never forget, Google is a very intelligent. It can help a person find what they are looking for even if the person doesn’t necessarily type in the best search terms of what they are looking for. As I mentioned earlier in this blog article, user intent is VERY important. That means, you need to focus on why the searcher made that request in the first place. However, if the keyword is “iPad Mini 16GB,” you can make an assumption that their intent is more to gain information about the iPad. These different types of intentions can be thought of as valuable stages in a marketing funnel. You can now take the extra step of creating articles derived from other high ranking articles that you can improve upon. You would go to Buzzsumo, type this keyword phrase in and take a look at these top 3 results. But, here’s the thing about this. 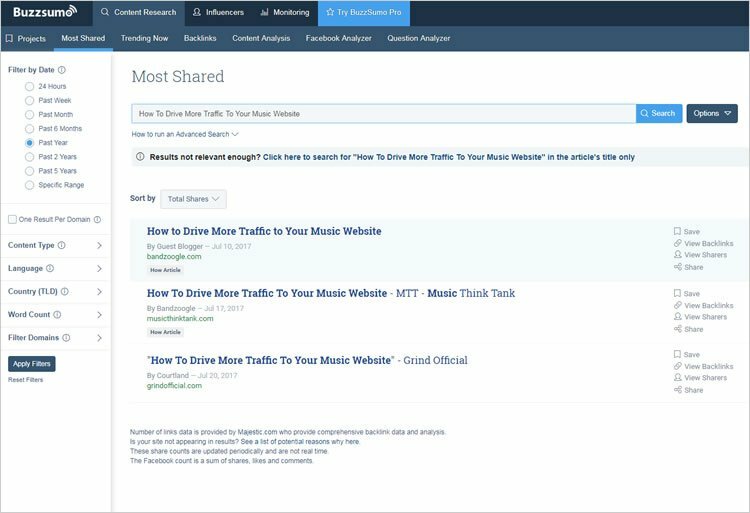 Many of the people looking for “How To Drive More Traffic To Your Music Website” are probably not looking for exactly those type of advanced strategies. They just want solutions. This is a great opportunity to create content the meets the needs of the user’s intent for that particular keyword or phrase. Which will result in a higher Google ranking. Let’s look at an example, using the long-tail keyword I mentioned earlier. These kind of headline titles will go to the first page of Google because they are user-intent focused. You ask why are they more likely to rise to the first page of Google? The answer is simple. They answer the searcher’s query. We need to understand that Google’s algorithm is primarily focused on giving the searcher the best results for the search query they provided. Create content that does this, and Google will reward you. I am always stressing to my clients that if they want to rank in Google, you have to blog. That means write comprehensive articles. Let me be clear. If you don’t publish content often, you will not get ranked. Don’t think that one article per month is sufficient. It’s NOT! Try once a week. Also, just don’t write a short article with no images or graphics. Make your articles at least 2000 words and break the text up with engaging images, videos and external and internal links. The best way to go about this, is to create content that you giving to your readers as a “Definitive Guide” to whatever they are searching for, rather than a generic post that they can find anywhere. Bring them value! Create content so valuable, that the reader feels as if you are giving away secrets for free. However, NEVER keyword stuff your articles. Google doesn’t like this. Google can easily detect when you are trying to trick their bots. So, now you have a great article online. Do you think it’s going to market itself? No way! Everybody knows that you need to put it on social media such as Facebook, Twitter, and LinkedIn. This is not Breaking News. But there is science and strategy to how you go about doing this. The key is to get it in front of the right audience. Influencer marketing is really big right now. Getting them to link to your content will drive a lot of traffic to your website. Video content is popular. YouTube is the second largest search engine behind Google itself. Create some videos and upload them to YouTube. If you are not comfortable with being on camera, create a video in audio form. Many people listen to YouTube, not just watch. Anything that will get the content out there, in front of as many people possible. The more your content is viewed, shared and people leave comments, the more likely you will be seen by Google as an authority. This means ranking higher in the results. So, just to conclude, ranking on the first page of Google is not as impossible as many people think. You need to put your focus on long-tail keywords. It takes some hard work and effort to create top notch quality content that provides value, then market it to the masses. But, if you do, you will no doubt see amazing results in ranking in the SERPs. Let me be very clear. Google is smart. Very smart. Don’t try to fool Google. Put in the work. Take your time. Make sure it’s the best quality content you can provide. Don’t be lazy and you will be rewarded. Bringing value to the business world is the way you will become recognized within your industry. You must provide the best quality content. No way around this. 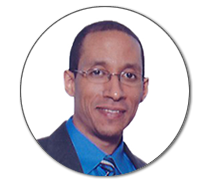 By following what I have noted above in this article, I guarantee you will rank much better than you are now… and with the right strategies, on the first page of Google. I hope this was informative and brought you value. Thanks for your time. Take care.